Milking the revived popularity of the Teenage Mutant Ninja Turtles for all it was worth, Konami quickly rushed into the summer market with a stand alone title which wasn't to follow any storyline seen on TV or recognizable game style inspirations, but rather offer a fresh take and more relaxed setting. 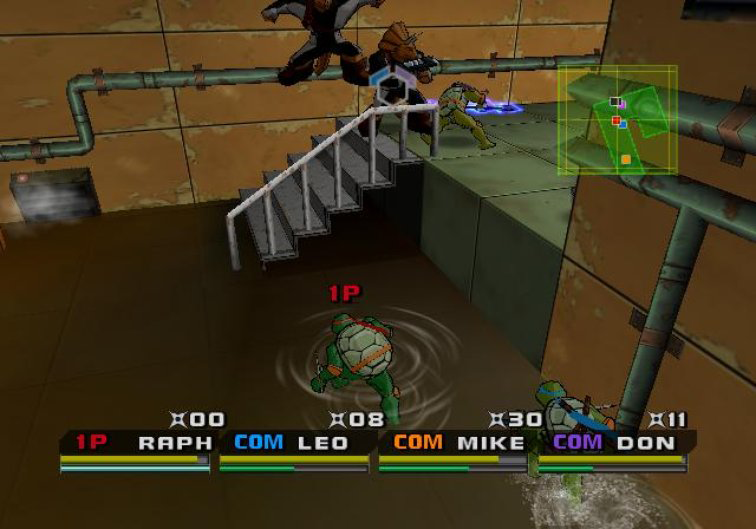 Teenage Mutant Ninja Turtles: Mutant Melee was developed at Konami Hawaii, which mostly served as a support developer or port coder for other Konami games, but on Mutant Melee they got a chance to be solely responsible from start to finish. 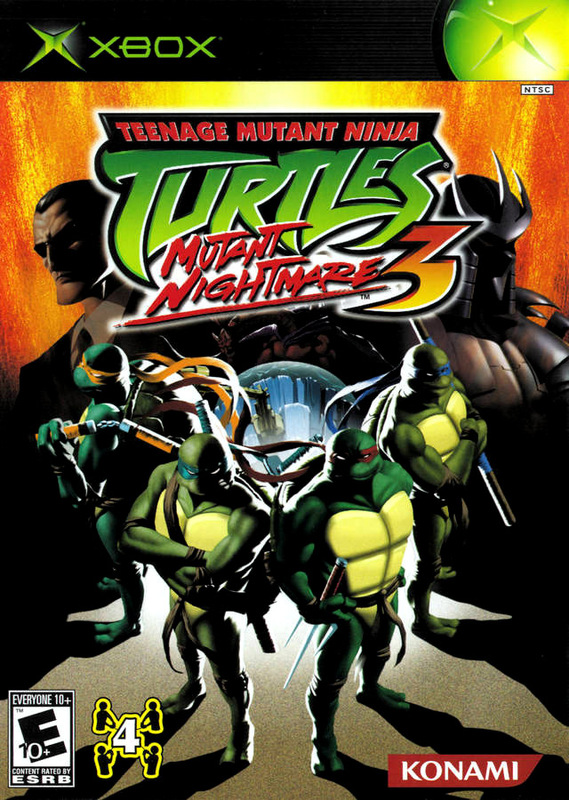 Even though the game is not technically a sequel, the PC version refers to the game as Teenage Mutant Ninja Turtles 3: Mutant Melee in its manual and in the installation process. 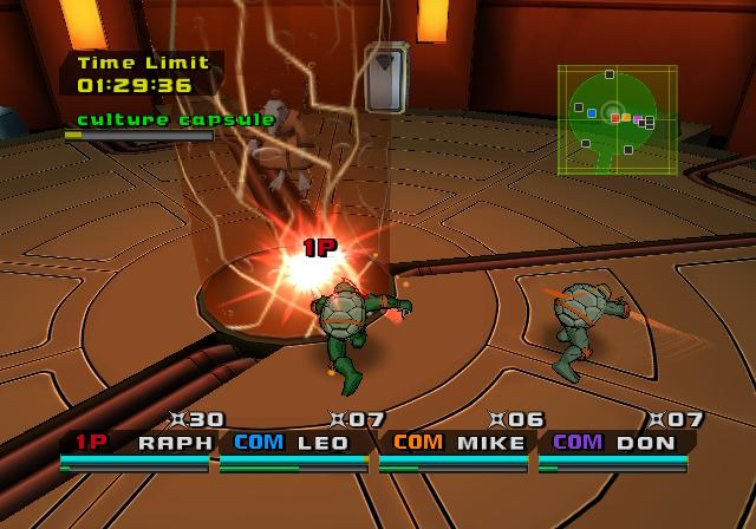 As the name suggest, Mutant Melee is a melee style fighting game, combining the elements of the previous 3D brawlers with the quick paced multiplayer fighter like Smash Bros and Power Stone. 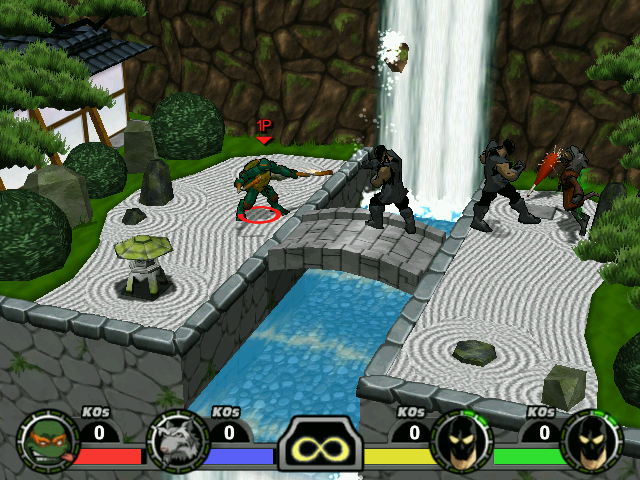 The attacks consist of simple dial in combos using the Attack and Alternate Attack buttons in sequence or in combination to trigger different moves. Each character controls largely the same, with different speeds and reach to differentiate between them. Apart from the standard attacks, items are scattered about and can be picked up for a limited amount of strikes. 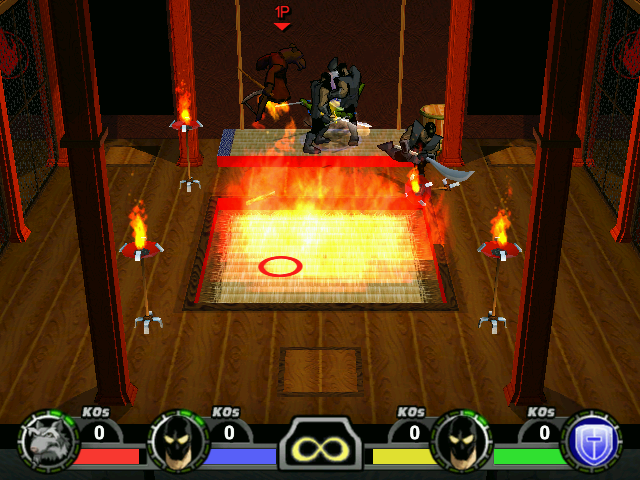 Being an arena fighter, the game hosts a wide range of stages for players to engage in combat on. The arenas are taken from all over the 2k3 animated show, with nearly every dimension, location and memorable scenery being represented in the game. Each stage feature a large number of interactive elements that can be broken and destroyed for items and other power ups, like pillars, boxes and furniture. Certain pieces of furniture and decorations can also be lifted up and used as a weapon. There are two main modes of play and three categories of rules to play under. 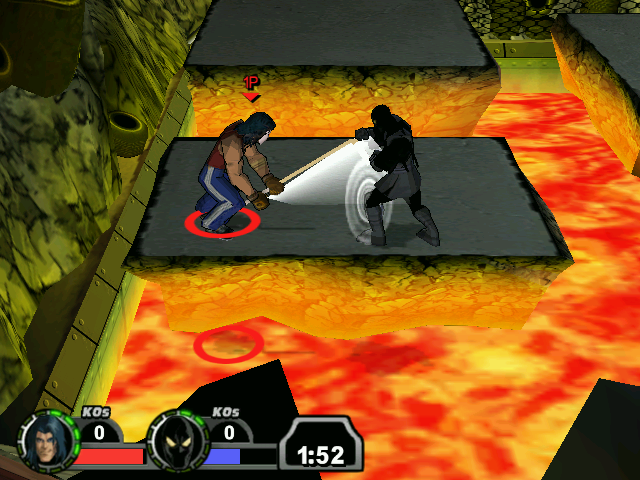 Adventure Mode is a string of levels tied together where the character of choice must overcome a set of obstacles and challenges displayed onscreen before each stage, while Melee Mode goes right into battle, allowing for up to four players to battle each other under the rules of Last Man Standing, Knock Out, King of The Hill and Keep Away. Last Man Standing is fairly self explanatory, while Knock Out awards points for each KO performed. King of the Hill and Keep Away are the two more interesting rules, as King of The Hill requires players to stand in a beaming circle that appears randomly over the map and will only award points when one single player stands inside of it, while Keep Away places a chest on the stage which needs to be carried off and guarded from the other players, however carrying makes it impossible to be on the offense. 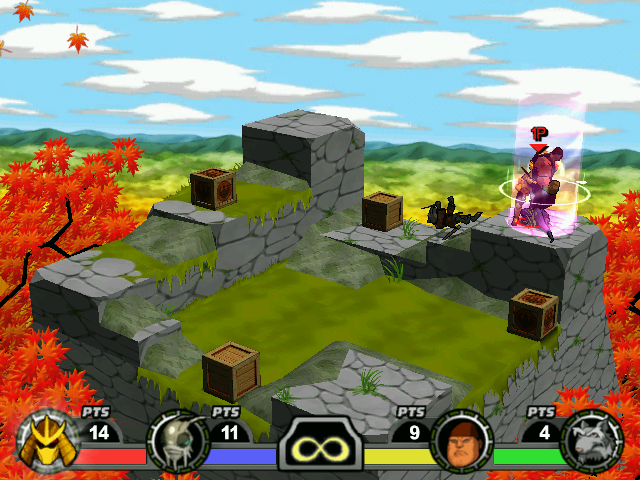 Adventure Mode unlocks several characters and secrets by playing through it. It's quite evident that the game was rushed to reach the spring season because Mutant Melee is paper thin, and the production values are of shoestring budget kind. 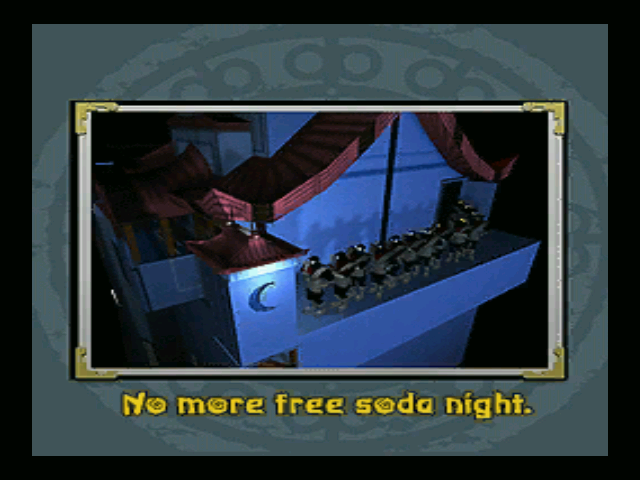 Rarely do you see a game that actually manages to make the stages look like cardboard cutouts like in a Z-grade movie, yet in Mutant Melee, each of the stage are so cramped, flat and unimaginative that even the most jaded of fans would have a hard time keeping these set pieces standing. A few show some attempts of branching a bit outside the rectangle barren two colored style this game has going by adding cars driving across the stage mid fight or roofs collapsing, but it only serves to frustrate further just how empty the experience is. The graphics unbelievably takes a larger step back in this game, so much so that it actually looks like a generation too late with the characters being distinctly block like and the shading being flat, not having much shadow or tone to give it depth. Most shockingly perhaps is the fact that even though the game takes place in such small and claustrophobic space and doesn't feature much in the way of visual effects, it has frame rate issues on all consoles. And it's the ultimate death sentence for the game to have such shoddy controls and unengaged fighting engine. 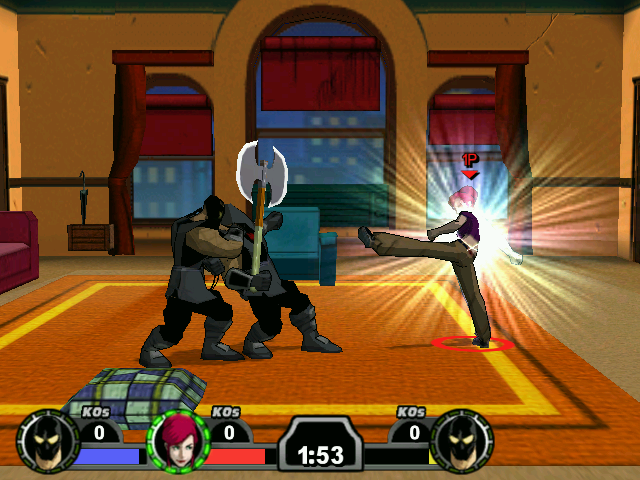 Building heavily on the moves seen in the previous 3D games, the combo system doesn't work at all in a melee fighter such as this, with long delays and cheap hit detection which usually results in hits landing when they really shouldn't, or characters being knocked dizzy without rhyme or reason of the weakest of strikes. Like with Battle Nexus, there is little incentive to actually investigate move sets much further than just spamming one button until victory. To find any true positive in the game, the standard assortment of unlockables and bonus content proves to be very interesting and well presented as had become the norm with this line of titles. The most interesting extra is the inclusion of the first issue of the Mirage comic book in its entirety, giving a broad audience a chance to discover the true roots in a slightly censored edition of the historic issue. There are also a larger assortment of comedy sketches using a slightly enhanced graphical layout with the entire cast of the game acting out of character in bloopers and NG shots made just for giggles, and works quite well since it shows that at least in one area of the game, the developers had a lot of fun with the assets. Mutant Melee also offers a first time opportunity to take the role as a Foot Soldier and battle the Ninja Turtles. But when a game only provides entertainment from either reading or watching 10 second long cutscenes, there's no saving grace. 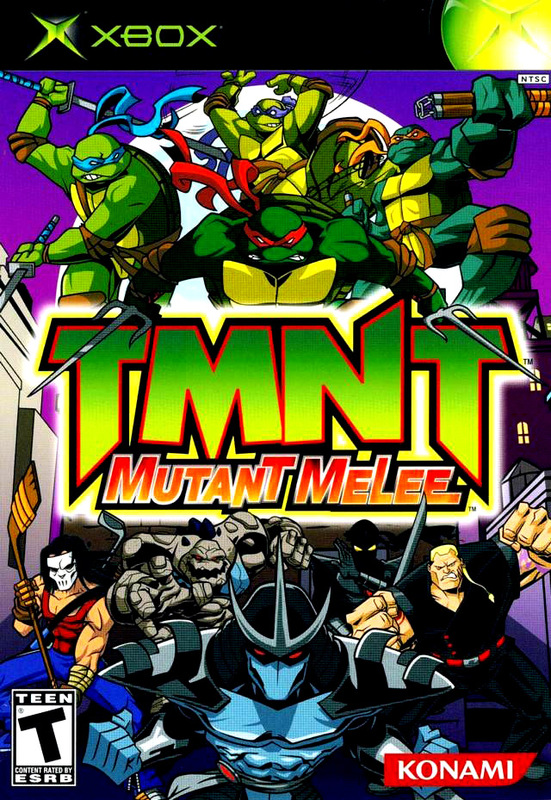 Mutant Melee is a rushed and messy experience which feels completely devoid of all charm and fun that is needed for a TMNT title to be enjoyed by any audience. 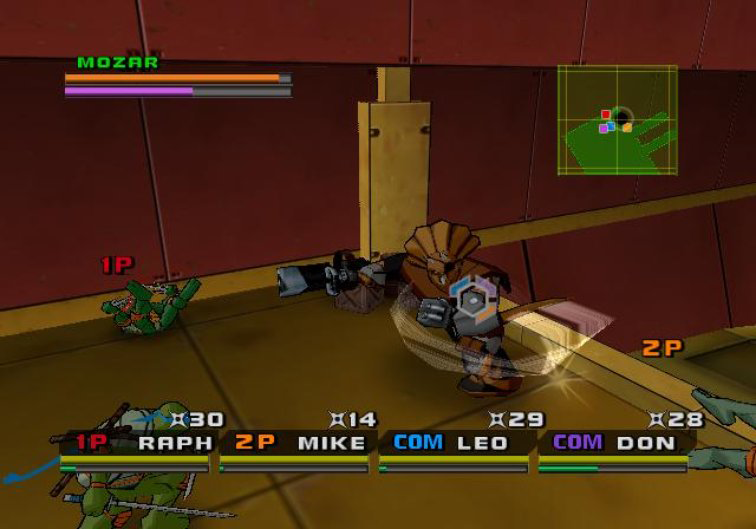 Mutant Melee was released in identical versions on all home console systems and the PC, though again the PC version is criminally sloppy and quickly ported from the Xbox version. It also suffers from a plethora of game crashing bugs which are triggered by the sound clips, and graphically, while it does support higher resolution, this is not natively supported, and the graphics are merely upscaled with a blurry filter from the SD resolution. 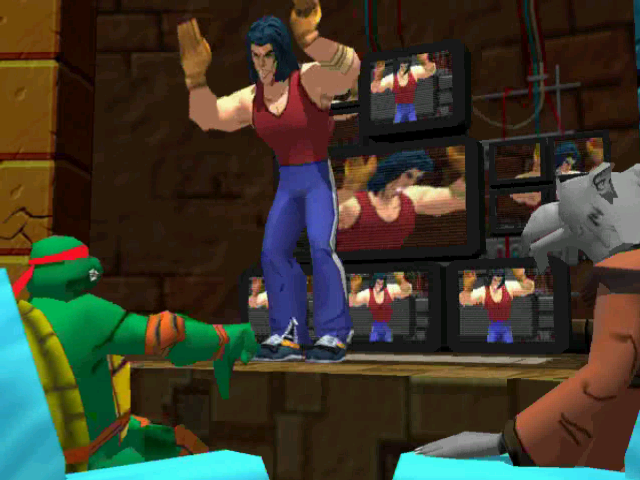 The extras in the game like the first issue comic book are also incredibly pixilated due to it being viewed on a higher resolution monitor rather than the TV. This was the last of the Konami games to be given a PC version. No handheld version was produced. Rounding out Konami's trilogy of 3D beat-em-ups, Teenage Mutant Ninja Turtles 3: Mutant Nightmare was released during the holiday season of 2005 following the template set before it by featuring a season spanning storyline with locations and casts taken from the ongoing TV show and adding in new exclusive segments to beef up the package. Facing the invasion of the Triceratons, the TMNT take to time travel to stop the prehistoric reptilians from the future, the ninja foursome also has to fight against the return of the Shredder and various other foes over a four episodic structure with each episode consisting of multiple stages on a linear path. 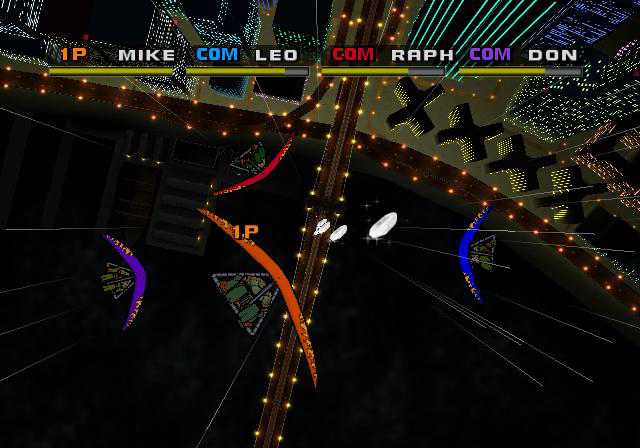 Between each stage comes an animated sequence either directly from the TV show or hastily made for the game itself, with some interjunction done to focus down the plot to suit the game progression. Mutant Nightmare runs on the same engine as the earlier games and plays almost identically. Rather than exploring new styles of gameplay or reinventing itself with innovating the genre, it falls back on the previous games, taking what works from both TMNT 2k3 and Battle Nexus and combines them. Combos and controls are simplified with faster and more responsive than before, with the whole emphasis of hot swapping to find the most strategically apt turtle being removed. 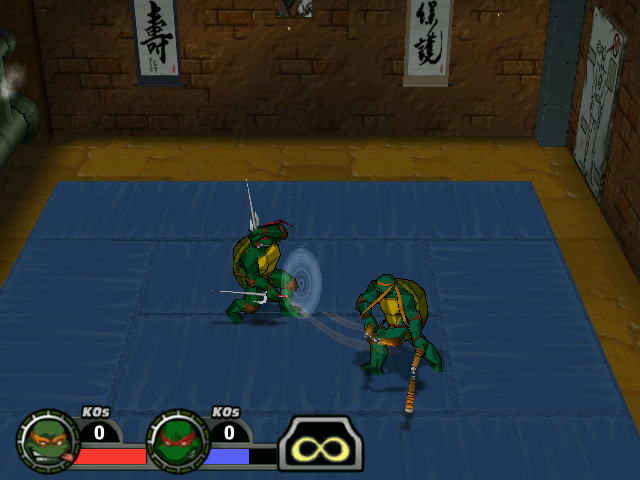 Each turtle have a larger set of moves from the start of the game, and can be updated by collecting crystals. This time around however, there is a shop system where players can purchase moves and other improvements on their own volitions along with finding scrolls on the stages. Each character is given their own health bars rather than sharing one this time around. 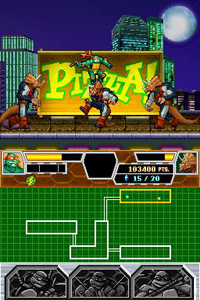 Stages are laid out the way they are distributed in TMNT 2k3 with episodic sections with levels within told in order, and the levels themselves are more in style of Battle Nexus with a mix of brawling and platforming, combined with certain sections of hoverboarding along with all new Hangliding and shuriken throwing scenes. The platforming sections are kept at a fair minimum in order to answer the overwhelming complaints received from the release of Battle Nexus. 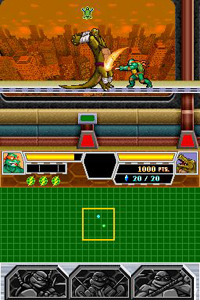 Other new features include the all new team-up moves, teaming up the turtles to perform a team move that takes out a great number of enemies surrounding them and also allocate some greater damage to the boss characters. There are also two new transformations that the turtles can perform, Dino Turtles and Ultimate Turtles, with Dino Turtles being an original design ,making the ninja brothers extra scaly and fearsome, while Ultimate Turtles are based on the Mystic Fury toyline by Playmates. The graphics are more or less identical to Battle Nexus, which by now have become rather archaic, lacking any improvement to differentiate it from the earlier games. In its own right it does look good and the animation as well as presentation is well executed, but it feels a bit tired the fourth time around. The video clips are fairly grainy as well, moreso than the previous games. But for most, Mutant Nightmare is remembered simply because of the ability to unlock Turtles In Time in its entirety. Unlocking the game is even hastily done in the game, only requiring the completion of the first episodic section. 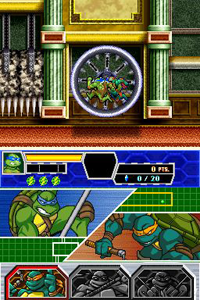 Being the arcade version of Turtles in Time, it does not include the extra stages found in the SNES version, and also music and other assets taken from the 1987 were removed and replaced with material from the new series. 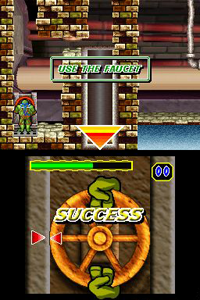 Konami's last turtle adventure completes the circle by ending up exactly where it started with the 2003 game, simplistic with ideas and features never taken much beyond the basic premise, and none of the games fleshed out enough to truly give a timeless experience unlike the games that can be unlocked in them. Mutant Nightmare is at the very least enjoyable and improved ever so slightly from Battle Nexus, but falls short compared to the other games on the market. Despite shifting from Game Boy Advance to NDS, Mutant Nightmare's handheld version is fairly similar to Battle Nexus, using the same engine and graphics straight lifted from that game, with only minor changes to the aesthetics to accommodate for the new features added to the game. The most immediate difference is of course the use of touch screen which is featured throughout the game and used in various ways to efficiency. For standard, it is used as map and team up system to call onto the other brothers to navigate through the enlarged areas and assist in fights. At times the bottom display will change into a puzzle specific view, requiring the use of touch to solve the many riddles and obstacles presented in the game. This system, along with the visual appearance of the game shares some similarities to the Castlevania series as they became available on the Nintendo DS as well. Combat is even further withdrawn from the overall game here than what it was in Battle Nexus GBA, though to Mutant Nightmare's credit the battles feel a bit more engaging thanks to the use of cooperation between the turtles and large colorful sprites. Rather the issue is with the fact that it's not much of a sequel, and rather a "2.5" deal with the game looking and feeling so identical to Battle Nexus, and stages dragging on for way to long for the novelty to survive. The touch screen features are cheesy and tacked on, par for the course of earlier titles on the DS, but this game was already one year into that handheld's lifespan and feels like a cheap GBA port with the least amount of creativity put into the touch puzzles, usually just involving turning a valve or typing a short numeric code. Compared to Battle Nexus, which was for the most part a very enjoyable game, Mutant Nightmare just serves to remind you of that particular title due to its likeness and raise the question "why aren't you playing that instead?" 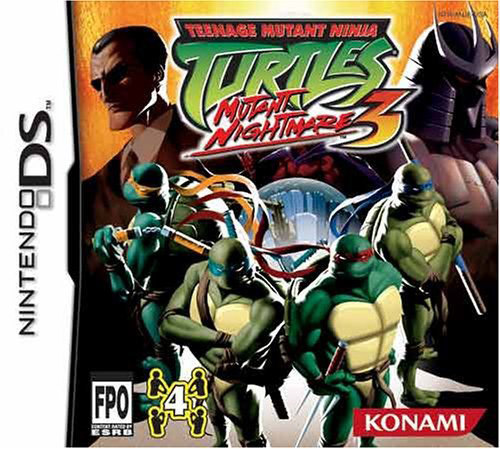 Mutant Nightmare DS was the very last Konami-developed TMNT game, and shortly thereafter they would let the deal come to a close and leave the franchise on the market for new developers to take a shot at. 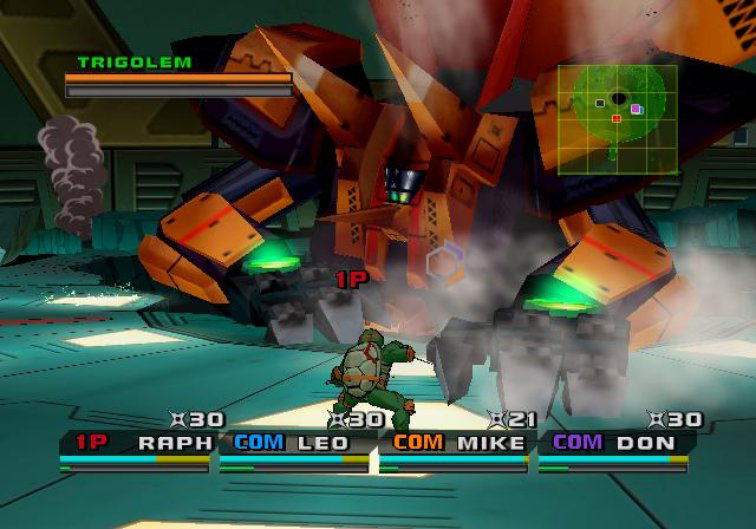 Baxter Stockman appears as an exclusive boss to the DS version.